Whenever amma asks me details about the blog and what my latest post is,it so happens that it'd be a cake or a baked goodie or something else.She always says,why don't you post something which we make on a regular basis,you know, different upkaris/ghashis etc.Which actually makes me sit and ponder. I started the blog way back in 2008 without a clue what blogging was all about.Initial entries of mine were all dishes made for breakfast,lunch and dinner.Slowly I graduated to posting stuff from different cuisines etc and after the baking bug hit,it was baked goodies all through. 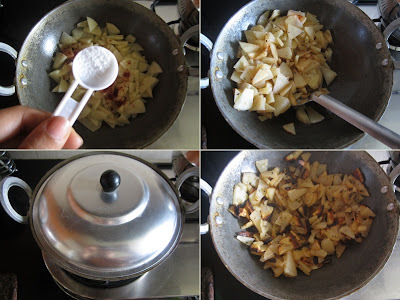 Sometime back when I made our favorite roast potato stir-fry,I thought about what amma said and decided to post this on the blog.So here is a very basic and simple potato stir fry which goes well with rice and dal and is a great combination with chapathi/rotis too. 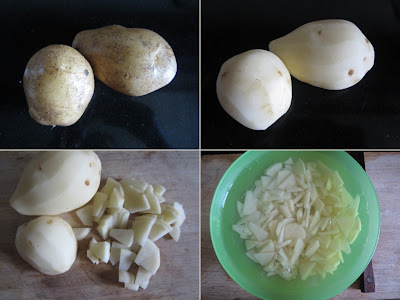 Peel and slice potatoes into thin triangular pieces and soak in enough water till required. 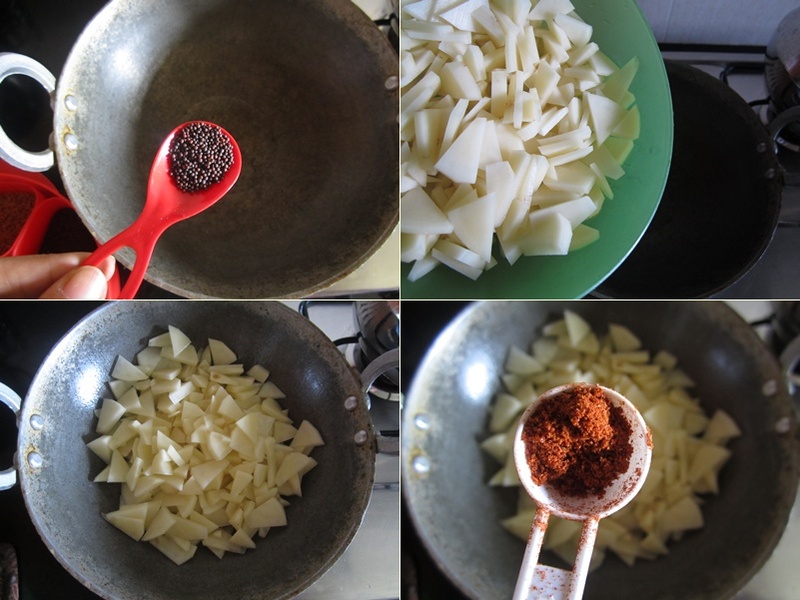 Drain the potatoes and mix in.Add red chilly powder and enough salt to taste. Stir well and cover with a tight lid and cook for 10 minutes stirring often. 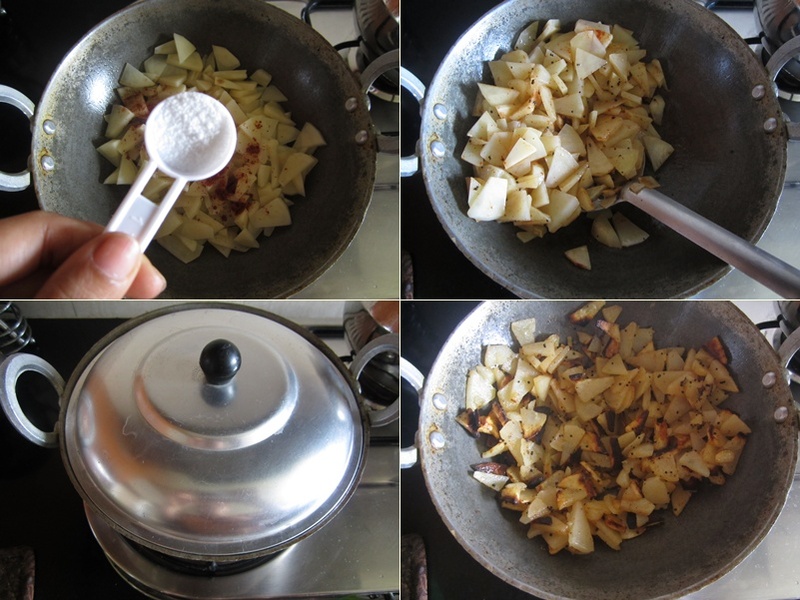 When the potatoes are cooked,remove the lid and cook for further 10 minutes on simmer or till the potatoes are roasted evenly. *Oil can be added as per ones choice-more oil would make the roasting speed up and the potatoes more crisp. I too make the same way..easy and tasty recipe..love it!! few ingredients still looks delicious. Hi. This used to be my favourite curry in school days and if Mom did not cook food of my choice, I would indulge myself in this. I guess your Mom's suggestion was very correct. One of my favourite dishes, make it anytime and relish it. QUick and easy breezy stir fry,would love to have simply with lemon rice..
Its looking yummy. i want to try this for a long time. will try soon..
Super delicious recipe !!!! Lookd so wonderful !!!! Sometimes normal posts are a nice change. Thanks for the post, now that I'm living alone, it's something I'll possibly try. 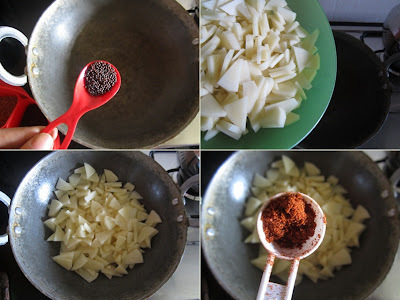 This is one of my all time favorite potato preparation! The only difference is that we add a pinch of hing and haldi instead of mustard seeds (since we didn't like mustard seeds as kids). I love to pair it with simple dal-rice for a comfort meal. Yes, please share more such simple recipes useful for everyday meals. Thanks! I hated mustard as a kid too.I sometimes make this using only jeera and haldi,tastes great with roti!